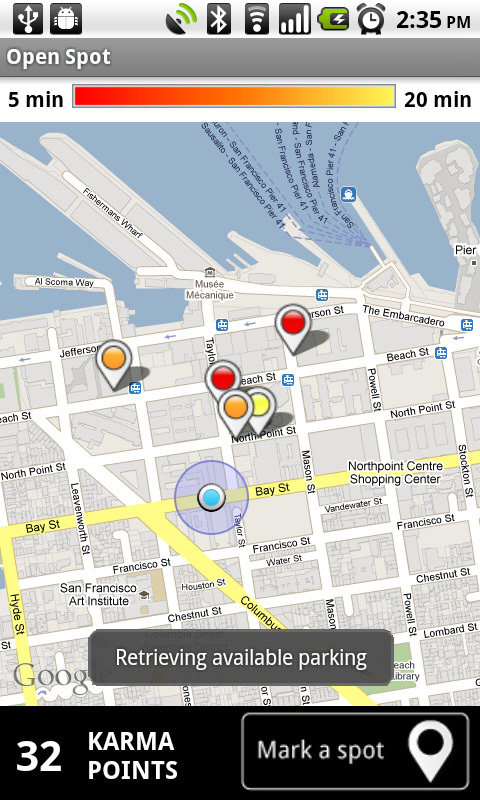 Open Spot is a brand new Android app aiming to help users overcome their parking woes. The app allows you to update a map when leaving a parking spot for others who may be in the same area frantically driving around looking for a free spot. This gives the controls in users’ hands who can not only help each other but also save gas, precious time and reduce pollution. The app shows a Google map near your current location and displays all open parking spots within a 1.5 km/0.9 mile radius. Spots are colour coded based on how ‘fresh’ they are. The spots remain on the map for 20 minutes and then disappear. All users need to do is mark their spot on their phones when leaving and everyone nearby will get the update. One can’t help but note that it would’ve been even more useful if users could also mark a spot as ‘taken’ on the map so all those heading towards a spot which appears free on their maps can re direct their cars instead of being disappointed at getting there and wasting fuel and time. The app is no doubt a well intended invention but it won’t work if not widely adopted. A small town can benefit from it only if majority of the residents start using the app, provided they all also use Android based phones. This might also be a luring tool from Google to convert people to Android as traffic and parking problems feature in the modern man’s life in a big way. Everyone adopted GPS for cars very quickly and it’s not ambitious to hope that ‘Open Spot’ may become widely spread and may also help Google in getting more Android users.